You might be using WeddingWire, TheKnot, or a number of other sources for your wedding planning. If so, you should be able to create and export your guest list from those sources. Google sheets is another great option. Excel or Numbers (Numbers is only on Mac) are also both perfectly fine! Throughout your wedding you are going to be using this list a lot! You can create extra columns to indicate Thank You notes sent (and what they gave you! ), seating assignments, how many guests will be attending from their group, and more! Using a spreadsheet style guest list will help keep things consistent, and orderly as we move forward to complete your project. I will download your sheet after you submit it, so if you make any changes, be sure to shoot me an e-mail. You can create separate columns for Salutation and add a second street address for apartments or P.O. Boxes too. For both custom calligraphy projects and digital printing it’s important that all of the addresses are consistent and free of spelling errors. 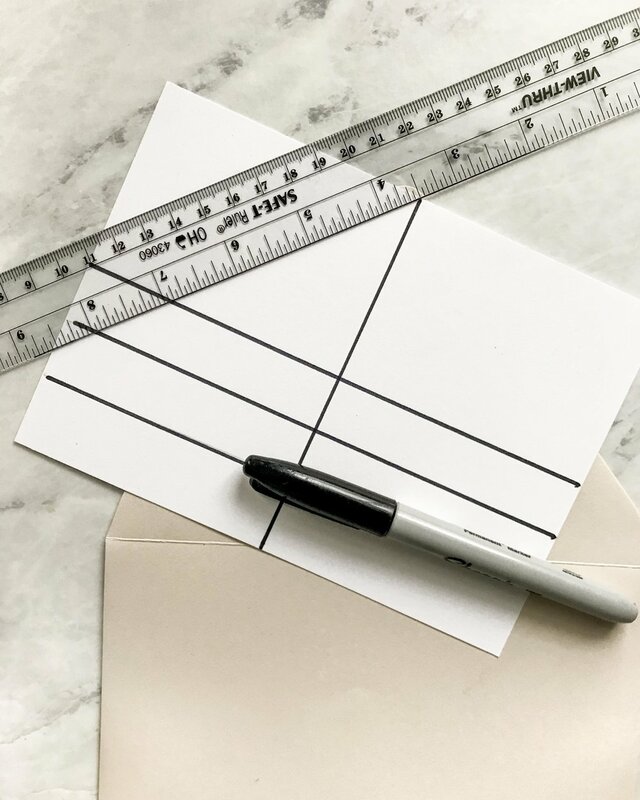 Here’s a few tips on polishing your guest list, what kinds of things get overlooked, and how you help your invitations go through the mail and to your guest’s homes. Questions about etiquette when addressing your guests? Spell out states, roads, avenues, streets, etc. Know some doctors? Use Dr. in place of Mr. or Mrs.
Doctors went through a lot of med school. Other salutations to be aware of: Honorable (for officials including judges, or people holding an office), and Miss (for ladies under 18). Know a Jr., how about a Sr.? Junior, senior, and all of the roman numerals. Fun fact: I’ve done an address for a 6th generation (I think it was William [last name] VI). Use our guide on how to address your guests, and make sure to be consistent with it throughout your guest list. There are a lot of ways to address people, especially today, and sometimes what is traditional and formal, just doesn’t feel as personal. Weddings have changed a lot over the past decade, and the type of event you are planning can help you quickly determine how you want to address your guests, because let’s face it, there are enough more complicated decisions you’re having to make right now. Here’s a quick reference. I suggest sending a separate invitation for anyone in a family that is over 18, but still lives at home. Create your list in Excel, or export it from The Knot/WeddingWire to a spreadsheet. Have columns for: name, street, apartment, city, state, and zip code. If you are able to separate them all out, it makes your list easier to use for a variety of purposes beyond envelopes. Be sure that each column shows the name and address exactly as you'd like them to appear on the envelopes. ex. Mr. and Mrs. John Smith. Always spell out states. Always. I also recommend spelling out roads, avenues, circles, drives. It will look so much more complete when your guest’s receive them. Proofread your list carefully! Someone always moves while you're trying to get your invites out–that's ok and we can fix that... just make sure all of the cities line up with their zip codes and the street address and apartment number are correct. I am a huge advocate for templates. I teach about them in my workshops, and I use them on almost every project. You will be able to address envelopes faster, and more consistently with the assist of a template. They are almost perfect, but here’s the biggest flaw: You can’t use them on dark colored envelopes, or envelopes with a liner already in them. For those situations, a lot of calligraphers love and use a SliderWriter. I personally don’t love this tool because the laser hurts my eyes, so I will set up a table template using a string and taping it down. I slip an envelope under the string and eyeball half-way down the envelope. Then I put a piece of tape on the table as a marker for lining up the next envelopes I write. I do use a laser level for other kinds of projects like signs and mirrors, but for envelopes, I’ll stick with templates. We are going to look at how I address light colored envelopes with a template. If you’re lining your own envelopes, hold off on inserting those until after all of the envelopes are addressed. 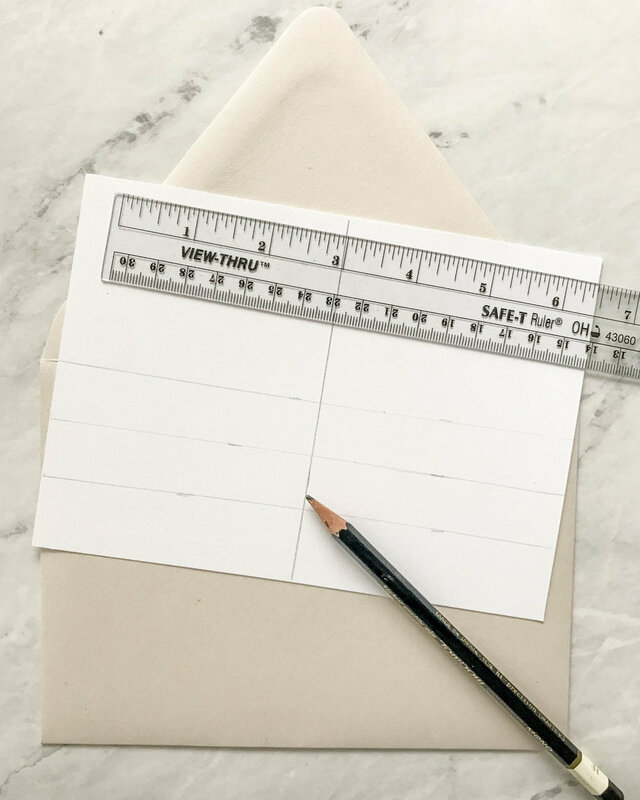 Cut a piece of card stock or bristol board to the dimensions of your envelope. Using a pencil, measure to the center of the bristol board both horizontally and vertically. If this is a first-time project for you, I recommend writing the guest’s name in calligraphy and then using capitalized block lettering for the street address. Measure .75” from the guest’s name line, make a couple of marks and use them to draw a straight line. From that line, measure another line down .75” for your city, state, and zip code. Go over your pencil lines with Sharpie so that they are bold. Put the template into the envelope as though it were your invitation so that you can see the lines through the paper. Address your envelope, remove the template, and insert it into another blank envelope. To avoid smudging when you remove the template, make a few templates so that you can leave one in the envelope while the ink has a chance to set and dry before you remove it. Insert the template, and begin writing! I like to make the top line of text larger so that the guest’s name stands out a little bit more, and then use the two address line guides to keep the text smaller. Let me know how your project turned out, and if you have any questions, leave a comment below for me to answer. Some light envelopes are still hard to see the template through. You can purchase a light pad which will shine light through the envelope making the template easier to see. Comment with any questions you have as you begin your own envelope projects! We can troubleshoot together. What is the Process for Invitation Design? While our process can be broken down into three chapters, custom invitations sometimes require custom processes too. Communication is always the top priority, and how we ensure that you will have an invitation suite unique to you that you love. This is a phone call to understand your style and design plans. After the phone call, I will send you my questionnaire to collect the important details such as how to spell your names and create wording for your invitations and details cards. Part two of the process shows you artwork and layout ideas. The proposal will outline all of the details your suite could include: handmade papers, silk ribbons, wax seals, and so many other possibilities. This will be your first look at the actual design of your invitations before we begin proofreading them. Once invitations are thoroughly proofread, we oversee all printing and production of your stationery. We work with professional printers that specialize in printing invitations with letterpress and foil printing. The majority of our digitally printed invitations are printed in our studio using some of the best printers on the market. Choosing the best printing method will depend on when you need your invitations to be delivered, how much you have budgeted, and the design or style you love. You probably didn’t know, but next to the quantity of invitations you will order, the printing method you choose will influence the cost of your invitations. You’ll quickly be able to know which printing method is right for your project based on cost, timeline, and artwork. Each printing method has different strengths and weaknesses. Digital printing can look like original artwork, or a long-lost love letter. Letterpress turns into a keepsake, something tangible. Foil printing is truly metallic, and can be printed on so much more than paper. When digital printing is done on high quality paper, it will look like each piece was done by hand—not printed. We take this into account when designing for a digitally printed invitation suite to make the artwork look like a true work of fine art. This method is probably the most familiar to all of us. Put the paper in the printer, and out pops the artwork magically on the page. There’s a little bit more to it though, good digital printing happens when the machine is tuned to perfection. 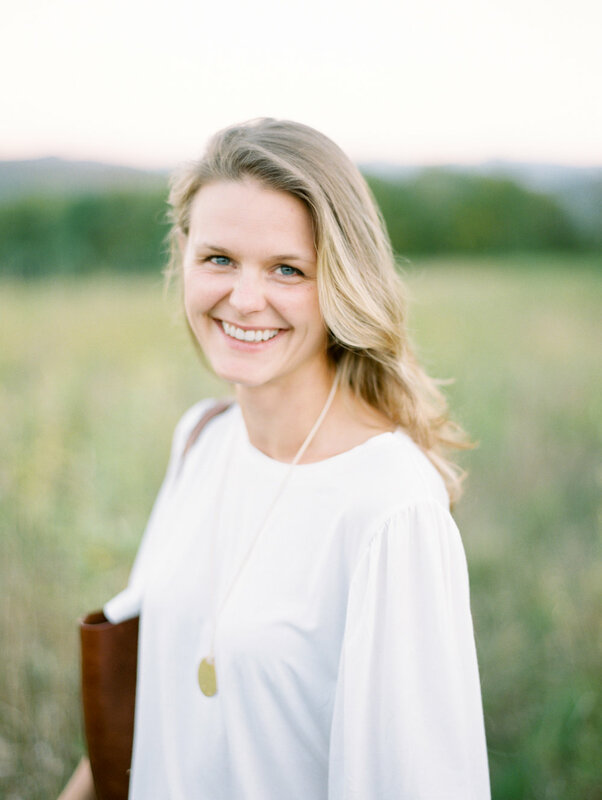 It takes an experienced and watchful eye to customize the settings for each job, and keep them consistent throughout the entire production of your invitation suite. Because of this, we do almost all of our digital printing in-studio to ensure the highest and most consistent quality we can. The most important consideration is the kind of paper used. High quality cotton papers can make artwork look like each piece was done individually by-hand. It gives your invitations dimension, meaning they don’t feel two-dimensional like a flat piece of paper, they feel three-dimensional… more like a keepsake. We’ve all heard of the printing press right? That innovation that changed history by making information sharable through books and newspapers (which are almost extinct today). Using similar printing machines as back then, letterpress printed invitations trumpet these early and important printing methods. Only one color can be printed at a time on the press, and each color needs it’s own unique plate. Adding multiple colors can quickly make your invitations expensive. You can print on any color and texture of paper, such as velvet or wood (and so many others). Like letterpress, foil printing uses a plate and a printing press machine. Foil printing adds another component to the printing process though: Heat, and metallic foil. Plates have to be made from metal, and are heated to around 220 degrees during printing. When the metallic foil is sandwiched between the hot metal plate and the paper, the foil is pressed into the paper permanently leaving you with foil printed cards that have a three dimensional feel. Foil printing is priced by the size of your card, not by how much foil is used. Doing two printing methods on your invitations will actually cost you more not less than printing the whole card in foil. Yay! You’ve gotten your lettering practice started, but maybe you’ve been dreaming for another way to use those letters. Creating layouts with grid paper is an easy way to make those super cute quotes you see on Instagram. The best part: you can reuse your grid paper templates over and over again! P.S. At the end of the post, you can download a printable version of my quote! You can make all kinds of layouts, this one is for writing five lines on a diagonal. 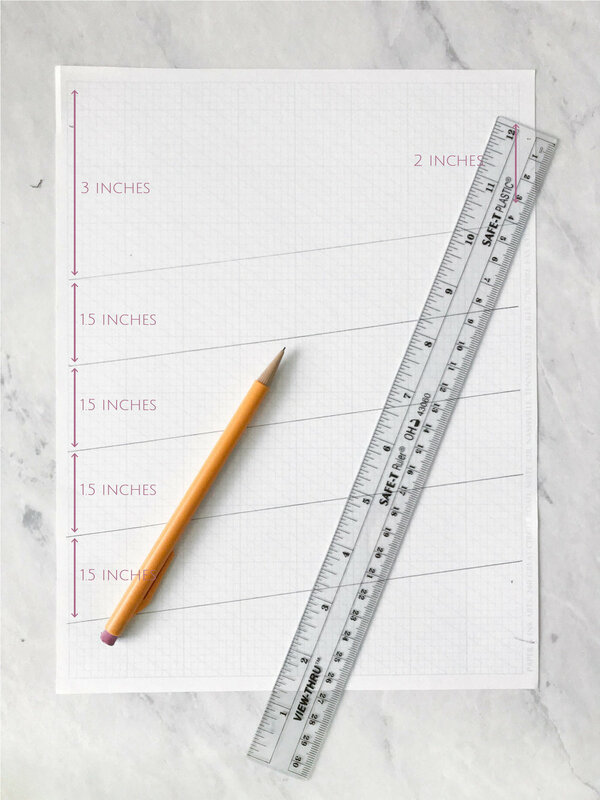 On the left margin of your grid paper, measure 3” from the top, make a little notch mark. 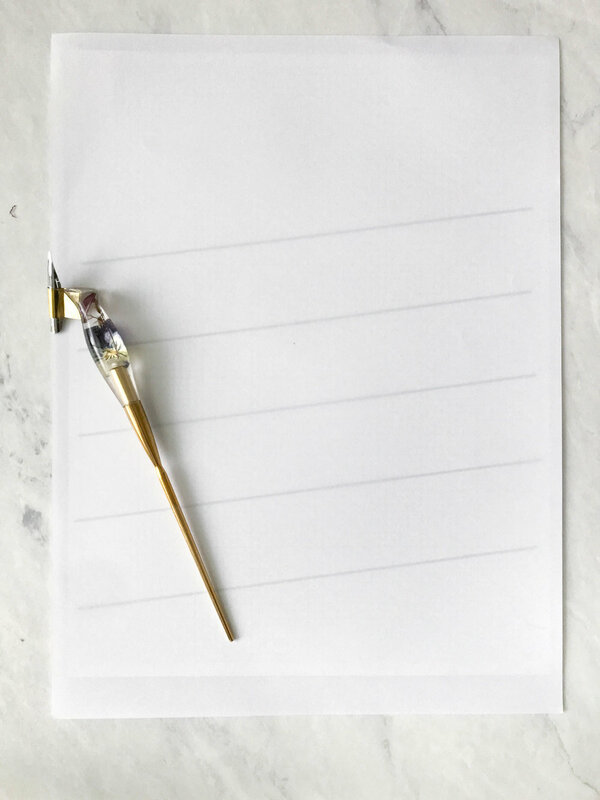 On the right margin of your grid paper, put a notch at 2” from the top. Use your ruler to create a straight line between the two notches. You have your first diagonal line! For the next four lines, measure 1.5 inches below the previous notch on both the right and left side of the page. Trace over your lines with black marker to make them easier to see underneath of your marker paper when you begin your writing. Place your marker paper on top of your template. You can also clip this on your clipboard to prevent the paper from moving! If you want to practice first, you can write your letters in pencil and then get the dip pen out to trace over your pencil lines. 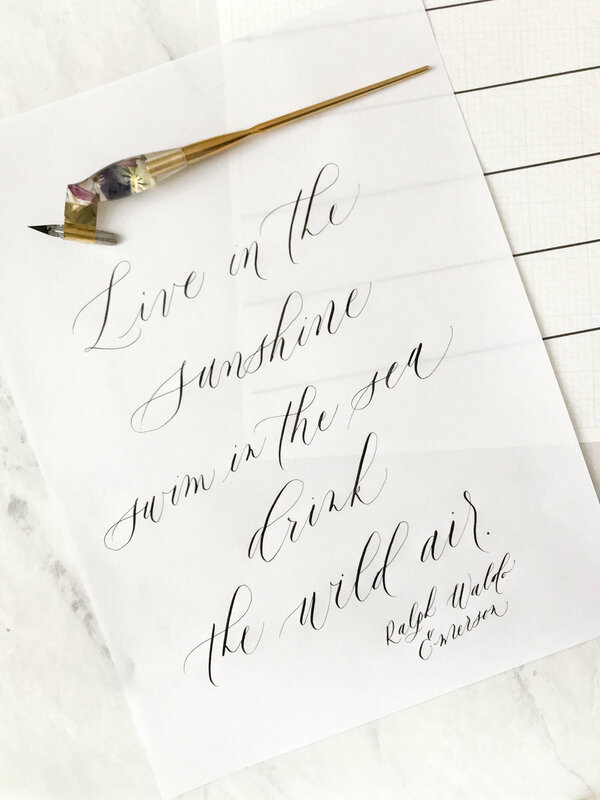 Write your quote using your dip pen! When you pull the marker paper off of the template, the lines disappear and you have a perfectly spaced out masterpiece! How many ticks are in the grasses I am running through. The hypochondriac in me weighs the likelihood I just got Lyme’s disease against the freedom from worry about the what-if’s and could-happen’s. Letting go. Running. Getting burrs in my shirt. Just thinking: I live here. The air is fresh, the sun is shining, and today I’m a human who is a little outside of her day-to-day office box. Obviously I would love to live in mental state #2 a little bit more often, and that’s what being the brawn behind Kindly does for me. I get to share a little bit more of who I want to be and who I am becoming. 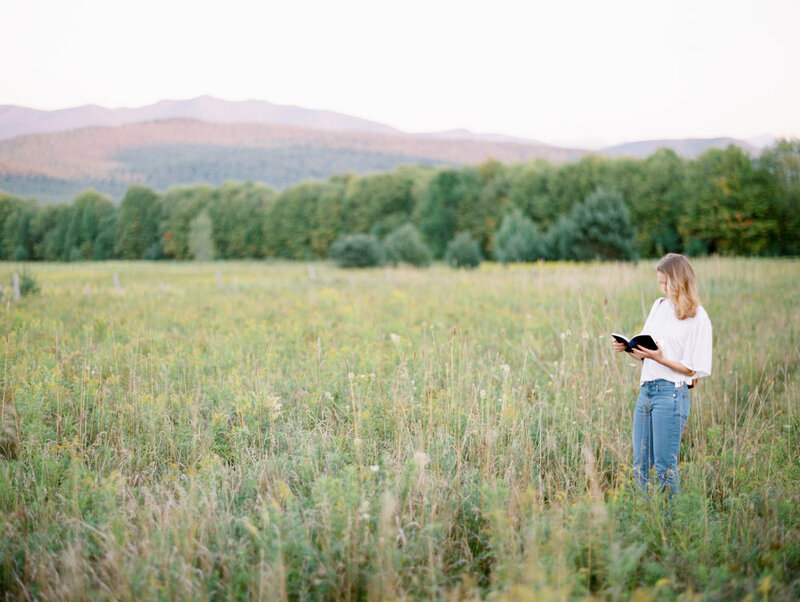 Thank you for encouraging me to keep running through the tall grasses. You'll only get updates when we get the confetti cannon out.